A total of 53 records matched your search. 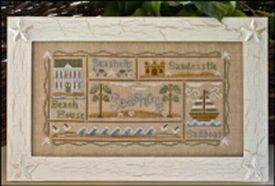 A Day at the Beach from Country Cottage Needlearts is stitched on 14/28count Lambswool with a stitch count of 165w x 84h using Sampler Threads, Crescent Colours and DMC floss with DMC alterantives for the hand-dyed fibers. 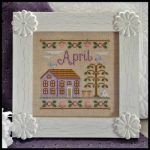 Cottage of the Month-April from Country Cottage Needlework is the fourth of the monthly cottages stitched on 14ct/28ct Lambswool with a stitch count of 77w x 77h. The pattern uses 1 Weeks Dye Works, 1 Crescent Colour, 1 Sampler hand-dyed fiber and 9 DMC floss, with DMC conversion provided. 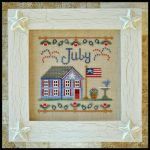 Cottage of the Month-August from Country Cottage Needleworks is stitched on 14/28ct Lambswool with a stitch count of 77w x 77h using 2 Gentle Art Sampler threads and DMC. DMC alternatives are provided for the Sampler threads. 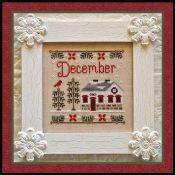 december Cottage from Country Cotttage Needleworks is the last of 12 cottages in the cottage of the Month series.It is stitched on 14/28 count Lambswool with a stitch count of 77w x 77h. Two Crescent Colours, 2 Weeks Dye Works and DMC floss are used. DMC alternatives are provided. 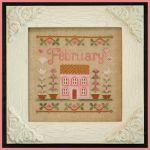 Cottage of the Month-February from Country Cottage Needlework is the second of the monthly cottages stitched on 14ct/28ct Lambswool with a stitch count of 77w x 77h. The pattern uses 3 Crescent Colours, and 3 DMC floss, with DMC conversion provided. 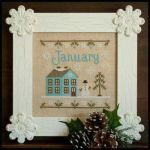 Cottage of the Month-January from Country Cottage Needlework is the first of the monthly cottages stitched on 14ct/28ct Lambswool with a stitch count of 77w x 77h. The pattern uses 1 Crescent Colour, 1 Weeks Dye Works and 7 DMC floss, with DMC conversion provided. 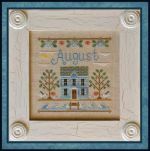 Cottage of the Month-July from Country Cottage Needleworks is stitched on 14/28 count Lambswool with a stitch count of 77w x 77h using 3 Crescent Colours, 2 Sampler Threads and DMC floss with DMC conversion available. 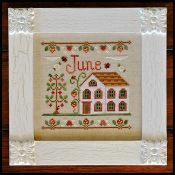 Cottage of the Month-June from Country Cottage Needleworks is stitched on 14/28count Lambswool with a stitch count of 77w x 77h using 1 Sampler hand-dyed fiber, 1 Crescent Colour hand-dyed fiber and DMC floss with DMC alternatives provided. 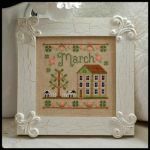 Cottage of the Month-March from Country Cottage Needlework is the third of the monthly cottages stitched on 14ct/28ct Lambswool with a stitch count of 77w x 77h. The pattern uses 1 Weeks Dye Works, and 6 DMC floss, with DMC conversion provided. 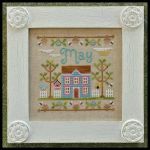 May Cottage from the Cottage of the Month series from Country Cottage Needleworks is stitched on 14/28ct Lambswool with a stitch count of 77w x 77h using Crescent Colours, Weeks Dye Works and DMC floss with DMC alternative available. 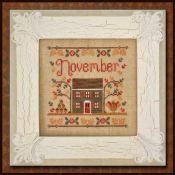 November Cottage from Country Cotttage Needleworks is the eleventh of 12 cottages in the cottage of the Month series.It is stitched on 14/28 count Lambswool with a stitch count of 77w x 77h. One Sampler Threads, 3 Weeks Dye Works and DMC floss are used. DMC alternatives are provided. 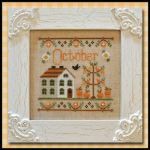 October Cottage of the Month from Country Cottage Needleworks is stitched on 14/28ct Lambswool with a stitch count of 77w x 77h using 2 Weeks Dye Works fibers and DMC with a DMC conversion. 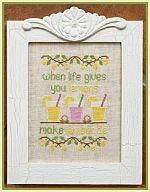 Count Your Blessings from Country Cottage Needleworks is stitched on 14/28count Lambswool with a stitch count of 110w x 82h using Crescent Colours, Gentle Art Sampler fibers and DMC. 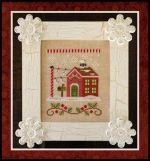 Farm Fresh from Country Cottage Needleworks is stitched on 14/28ct. Lambswool with a stitch count of 110w x 82h using DMC floss. 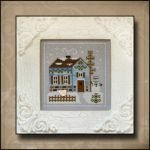 Frosty Forest-Bluebird Cabin from Country Cottage Needleworks is stitched on 32ct Pearl Grey with a stitch count of 65w x 65h using 1 Weeks Dye Works fiber with DMC alternative and DMC floss. An owl button is available from Just Another Button Company. 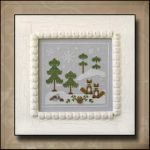 Frosty Forest-Raccoon Cabin from Country Cottage Needleworks is stitched on 16/32 count Pearl Grey with a stitch count of 65 x 65h using 1 Sampler thread with DMC alternative and DMC floss A blue bird button from Just Another Button Company is available. 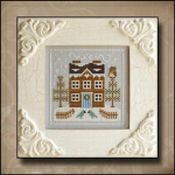 Frosty Forest, Snowman's Cottage from Country Cottage Needleworks is stitched on 32 count Pearl Grey Linen with a stitch count of 65w x 65h using 2 Weeks Dye Works fibers with DMC alternatives and DMC threads. A bird button from Just Another Button Company is available. 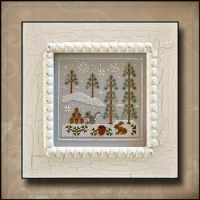 Frosty Forest, Snowy Friends from Country Cottage Needleworks is stitched on 32 count Pearl Grey Linen with a stitch count of 65w x 65h using 1 Classic Colourworks (Crescent Colours)with DMC alternative and DMC floss. An acorn button from Just Another Button Company is available. 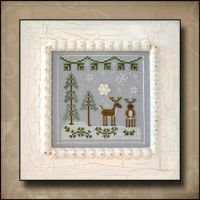 Frosty Forest, Snowy Reindeer from Country Cottage Needleworks is stitched on 32 count Pearl Grey Linen with a stitch count of 65w x 65h using 1 Gentle Art Sampler fiber with DMC alternative and DMC floss. An snowflake button from Just Another Button Company is available. 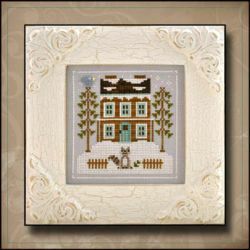 Frosty Forest,Snowgirls Cottage from Country Cottage Needleworks is stitched on 32 count Pearl Grey Linen with a stitch count of 65w x 65h using 2 Sampler Threadswith DMC alternative and DMC floss. An bird button from Just Another Button Company is available. 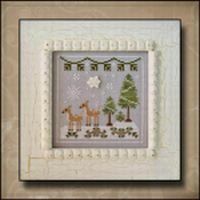 Frosty Forest, Snowy Fence from Country Cottage Needleworks is stitched on 32 count Pearl Grey Linen with a stitch count of 65w x 65h using 1 Sampler Thread with DMC alternative and DMC floss. An pine cone button from Just Another Button Company is available. 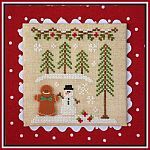 Gingrebread Village- #2-Gingerbread Girl & Peppermint Tree from Country Cottage Needleworks is stitched on 16/32 count Lambswool or fabric of your choice with a stitch count of 55w x 60h using DMC, 2 Classic Colorworks and 2 Weeks Dye Works with DMC alternatives provided. A gingrbread girl button is available. 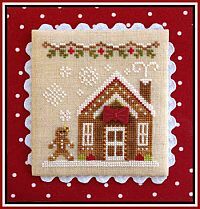 Gingerbread Village-Gingerbread Train, the first of this series from Country Cottage Needleworks is stitched on 16/32 count Lambswool or a fabric of your choice with a stitch count of 110w x 60h using DMC, 2 Classic Colorworks and 2 Weeks Dye Works hand-dyed fibers with DMC alternatives provided. A gift button is available from Just Another Button Company for $1.75. Peppermint Swirl wheels can also be added. 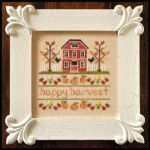 Happy Harvest from Country Cottage Needleworks is stitched on 30 count Light Examplar Linen from Lakeside Linen or a fabric of your choice with a stitch count of 81w x 81h using Crescent Colours, Weeks Dyed Works hand-dyed fibers with DMC alternative. 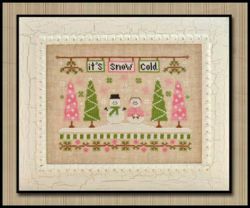 It's Snow Cold from Country Cottage Needleworks is stitched on 16/32count Lambswool with a stitch count of 119w x 87h using 6 DMC colors. 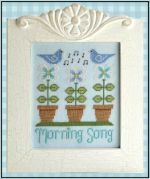 Morning Song from Country Cottage Needleworks is stitched on 16/32 count Fabric Flair Blue with a stitch count of 73w x 89h using 1 Weeks Dye Works fiber with DMC alternative and DMC floss. 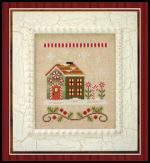 Poinsettia Place from Country Cotttage Needleworks is the second of 12 houses in the new series of Santa's Village. It is stitched on 16/32 count Lambswool with a stitch count of 72 w x 88h. 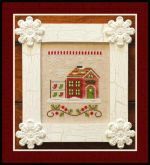 These houses can be stitched individually or on one piece of fabric with a cut size of 24" x 24" allowing 3 inches around the design. Two Sampler Threads are used with DMC floss. The DMC Alternative is provided. A Just Another Button Company cardinal button is available. 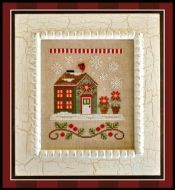 Pumpkin Cottage from Country Cottage Needleworks is 28 count Country French Cafe Mocha Linen, a 14 count comparable fabric can be used with a stitch count of 117w x 90h using 2 Crescent Colours and 2 Sampler Threads and DMC. A DMC conversion is available. 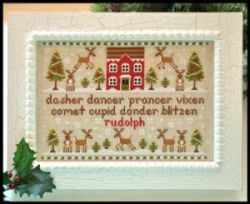 Reindeer Games from Country Cottage Needleworks is stitched on 16/32count Lambswool with a stitch count of 145w x 103h using DMC floss. 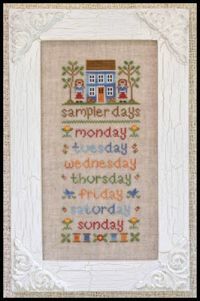 Sampler Days from Country Cottage Needlework is stitched on 16/32 count Lambswool with a stitch count of 61w x 142h using 4 Classic Colorworks, 1 Sampler threads and DMC floss. 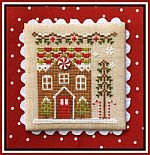 Santa's Village-Candy Cane Cottage from Country Cottage Needlework is stitched on 16/32ct Lambswool with a stitch count of 72w x 88h using DMC and Crescent Colours fiber. A Just Another Button Company Candy Swirl is available. 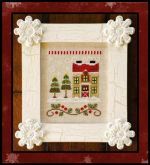 Santa's Village Christmas Tree Farm from Country Cottage Needleworks is stitched on 16/32 Lambswool with a stitch count of 72w x 88h using 2 Weeks Dye Works fibers and DMC floss with DMC alternative. This pattern can be stitched with the other designs in this series. A button from Just Another Button Co. is available. 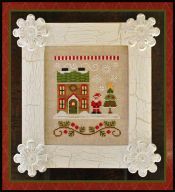 Santa's Village-Elve's Workshop from Country Cottage Needleworks is stitched on 16/32 count Lambswool with a stitch count of 72w x 88h using DMC floss, 1 Weeks Dye Works and 2 Sampler threads with DMC alternative. A tiny wreath button is available from Just Another Button Company. 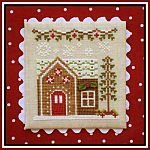 Santa's Village-Gingerbread Emporium from Country Cottage Needleworks is stitched on 16/32 count Lambswool with a stitch count of 72w x 88h using DMC, 1 Weeks Dye Works and 2 Sampler threads with DMC alternative. Gingerbread Man button is available from Just Another Button Company. 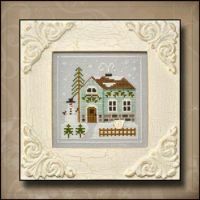 Santa's Village-Hot Cocoa Café from Country Cottage Needleworks is the last in this series stitched on 16/32ct Lambswool with a stitch count of 72w x 88h. 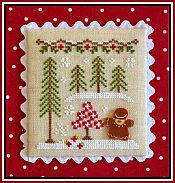 DMC and 1 Gentle Art Sampler fiber is used. A tiny rose button is available from Just Another Button Company. 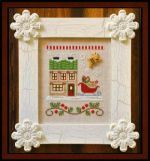 Santa's Village, Mrs. Claus' Cookie Shop from Cottage Needleworks is stitched on 16/32 count Lambswool and may be stitched individually or as a group with eleven other designs. DMC floss and 1 Crescent Colours fiber is used with a DMC alternative available. A cookie button from Just Another Button Co. is available. 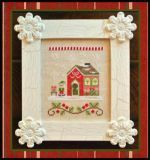 Santa's Village-North Pole Post Office from Country Cottage Needleworks is stitched on 16/32ct Lambswool with a stitch count of 72w x 88h using 3 Weeks Dye Works hand-dyed fibers and DMC floss with DMC alternative available. A tiny dove button from Just Another Button Company is available. 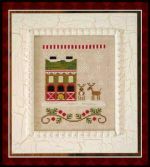 Santa's Village-Reindeer Stables from Country Cottage Needleworks is stitched on 16/32 Lambswool with a stitch count of 72w x 88h using 2 Weeks Dye Works hand-dyed fibers and DMC floss with DMC alternatives available. A small sleigh bell button from Just Another Button Company is available. 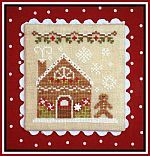 This pattern may be stitched individually or with the other 11 houses in Santa's Village. 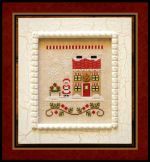 Santa's House from Country Cotttage Needleworks is the first of 12 houses in the new series of Santa's Village. It is stitched on 16/32 count Lambswool with a stitch count of 72 w x 88h. 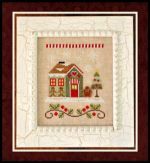 These houses can be stitched individually or on one piece of fabric with a cut size of 24" x 24" allowing 3 inches around the design. One Crescent Colours is used with DMC floss. The DMC Alternative is provided. A Just Another Button Company star button is available. 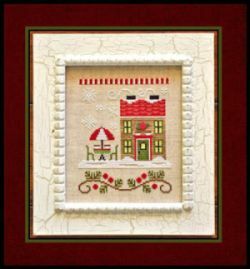 Santa's Village-Santa's Sleighworks from Country Cottage Needlework is stitched on 16/32ct Lambswool with a stitch count of 72w x 88h using DMC and Crescent Colours fiber. A Just Another Button Company Sleigh button is available. 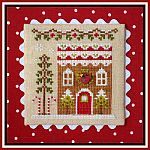 Santa's Village-North Pole Post Office from Country Cottage Needlework is stitched on 16/32ct Lambswool, either individual or as a group with 11 other designs from the Santa's Village. Individual stitch count is72w x 88h. 3 Weeks Dye Works hand-dyed fibers are used with DMC floss and DMC alternatives for the Weeks Dye Works. A tiny dove Just Another Button Co. button is available.